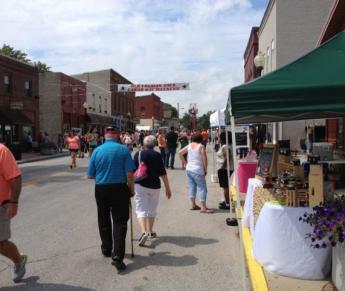 The North Salem Old Fashion Days festival is a much-anticipated, annual event in Hendricks County. From pie-eating contests to quirky and hilarious bed races down Pearl Street, this long-time, small-town Labor Day Weekend gem has a little bit of everything for you to truly experience Midwest Americana at its best. The festival kicks off with a good ole smorgasbord breakfast from 7-10 a.m. at the United Methodist Church, 104 W. Pearl St. Then, from 10:30 a.m.- 3 p.m., the Christian Church, 6 N. California St., will serve a pork chop dinner with proceeds helping community children with church camp expenses. I felt talking food first would be the way to go, and at these church gatherings, you will get a sense for what Hoosier hospitality is all about. One of the top attractions you won&apos;t want to miss also occurs on Saturday. The Old Fashion Days Parade, known as the largest parade in the county and a staple of any small-town festival, begins at 11 a.m. Get your candy-catching kiddies ready. My other recommendations on Saturday include the Kiddie Tractor Pulls down Pearl Street, which begin at 1 p.m. and the Truck Pull at Machinery Field beginning at 3 p.m. You will want to check out the live music and food and craft vendors, whichever day you plan to go. An old-fashioned festival would not be complete without a pie-eating contest, and that is exactly what you will find on Sunday of the festival with registration at 11 a.m. and the contest at 11:30 a.m.
You also won&apos;t want to miss the car show that begins at noon on Main Street and the Horse Pull at Machinery Field at 6:30 p.m. In between, you can check out some line dancing and of course the food and craft vendors. Monday may be the final day of the festival, but the activities certainly don&apos;t slow down any. The day begins with a 10k, 5k run & walk or 13 or 30 mile bike ride beginning at 8 a.m. This event is understandably popular as routes provide participants with a constant, gorgeous country view. Registration begins at 6:30 a.m. or online here. Entry fee is $22 for participants that pre-register by Sept. 1, or $25 thereafter. Bike ride registration can be filled out online, here. All run, walk and ride participants will receive a food voucher that can be used for a free smorgasbord breakfast or a meal at the various food vendors. Other top activities on Monday include the Pet Parade at 10 a.m. and Pizza-eating Contest sponsored by local favorite Perillo&apos;s Pizzeria at 3 p.m., though registration is at noon. I&apos;m pretty sure anyone who has been to Perillo&apos;s feels like they attempted an eating contest because it is so delicious. This should be interesting. But in my mind the Bed Races down Pearl Street is the must-see event of the weekend! Registration is at noon and the event begins at 1:30 p.m. This is fascinating and hysterical - good old-fashioned festivities. This is just a mere glimpse of what you&apos;ll find throughout this three-day festival. They have also added kids entertainment, including pony rides and a bounce house, that will be open all weekend following the parade. Live music and a free open mic stage also will pump out entertainment all weekend long. 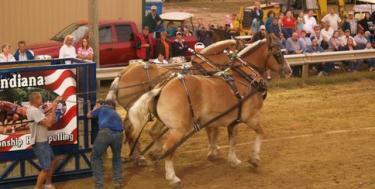 Make this the year you bring the whole family to North Salem&apos;s Old Fashion Days.